Throwback Episode – Episode 12 – Discounts, Black Friday, & Cyber Monday Oh My! Today is a throwback episode! We will be back next week with an all new episode! In this Episode Caroline and Kelly talk all about discounts-Should you or should you not give them and if so, what types of discounts should you offer? Caroline and Kelly share their ways of how they use discounts, what types of discount codes they use and who they offer them to! Caroline and Kelly talk about the different types of percentage discounts they give to their customers! Etsy shop owners, this can be set up automatically for your customers! 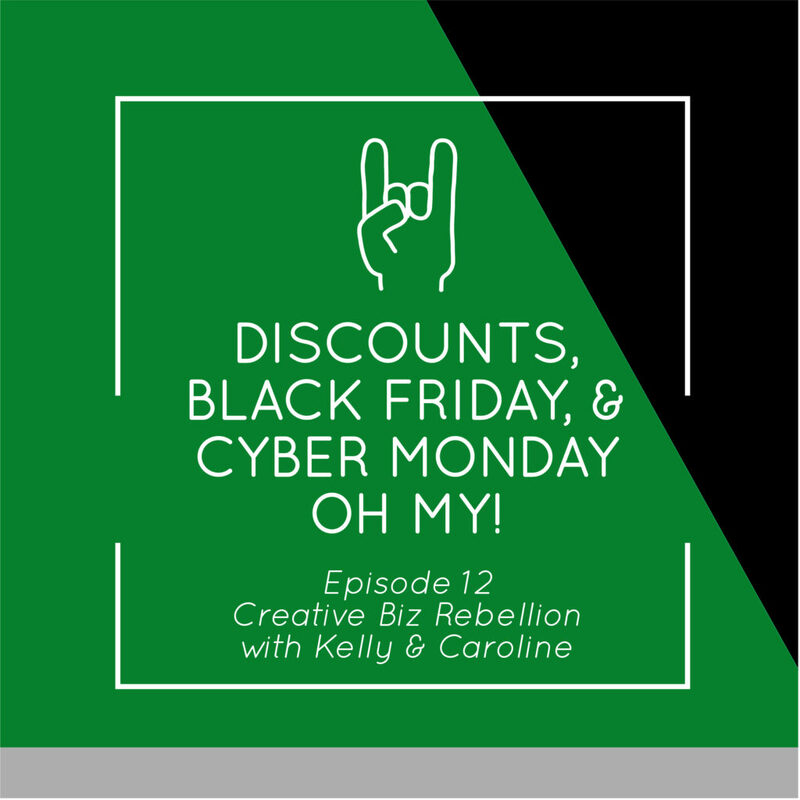 Caroline and Kelly talk about the all the ways they offer discount codes for repeat buyers, new orders, holidays, anniversaries and through newsletters! What’s better??? Free Shipping or discounts?? Find out what Kelly has learned about free shipping and why it may be better than offering a discount! I mean, who doesn’t love free shipping! Just be careful on how you are using them and how your customers perceive them. So what are the advantages of using them? Think about ways how you can use it to upsell or increase your cart! Maybe if they buy a certain amount of a product, they get something for free?? You need to do what works for you! Find out how Caroline and Kelly take advantage of using discount codes! Caroline and Kelly talk all about whether or not you should be doing giveaways. Giving away a product for free gets people to your shop, but most importantly, you must keep it brand related. Ever try loop giveaways??! Maybe now is the time! Just make sure it all ties in with brand, vision and mission of your company. Find out what big giveaways/discounts Kelly and Caroline plan on doing this November! Something special for those certain lines of people that follow you to get them more involved in your company. What types of discounts are you going to do for your biz?! Caroline and Kelly talk about what they plan on doing for their holiday giveaways for their shop! People love free! Think about your discounts and how to use them effectively! Try some new things!